(Jack-in-the-Pulpit (Arisaema triphyllum) - 01) The most distinctive feature of the jack-in-the-pulpit is its hooded flower, but it can often be overlooked as being just another leaf, as it is mostly viewed from the top. 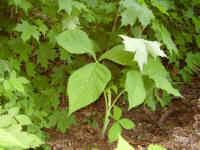 However, the three pointed leaflets of the palmate leaf atop a stem in close proximity to the "pulpit" make it stand out on the floor of moist woods and thickets. 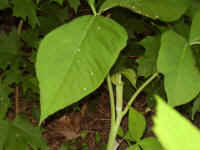 Sometimes, as in this picture, there will be two 3-fingered leaves forming a "V". (Jack-in-the-Pulpit (Arisaema triphyllum) - 02) Jack can be seen standing in the pulpit, if we crouch down or we gently lift the hood-like spathe. 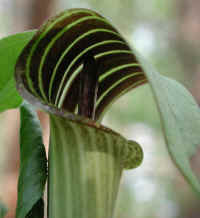 One of the distinctive features of the jack-in-the-pulpit are the stripes on the "bowl" of the pulpit and those on the underside of its "canopy" or hood. 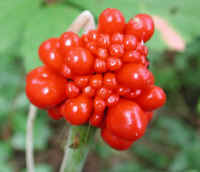 The literature says that jack-in-the-pulpit can grow to one to three feet high, but we have never seen them over one foot. 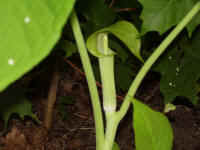 Our experience has been that when flowering, they are usually only about six inches high. (Jack-in-the-Pulpit (Arisaema triphyllum) - 03) Note the difference in coloration of this jack-in-the-pulpit from the previous photographed variety. The literature tells us that there are three major varieties which differ mainly in the color striping of the spathe or hood, which can be green, purple or white. What we have not found is any mention of the different color of "Jack". 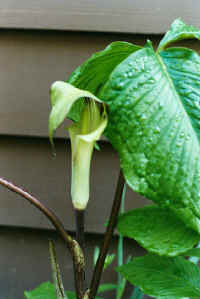 The Woodland jack-in-the-pulpit has purple-brown stripes, and its albino form has green stripes. 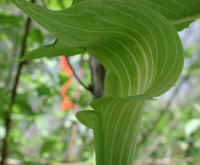 The Northern jack-in-the-pulpit has white ridges outside and purple-brown stripes inside. 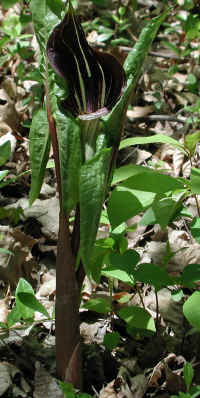 The Swamp jack-in-the-pulpit is nearly black. (Jack-in-the-Pulpit (Arisaema triphyllum) - 04) We marvel at all the interesting things that God has spread out upon this earth for us to enjoy and preserve for future generations. 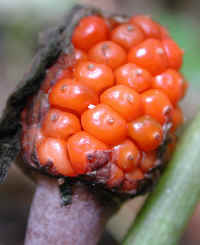 The jack-in-the-pulpit is just one of these points of interest we look for every spring. This wildflower is also called "Indian turnip", because of its corms which the Native American ate. 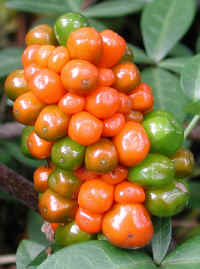 The jack-in-the-pulpit can be found all along the eastern seacoast of the United States and as far west as Kansas. I will tell of all Thy wonders [miracles]. Our hope is that when we do this, we will no longer harm each other, or the animals, or the environment. (Jack-in-the-Pulpit (Arisaema triphyllum) - 07) We have found different shades of coloration on both "Jack" and the "pulpit." The "Jack" in this jack-in-the-pulpit is green, which was the first one of this color we encountered. (Jack-in-the-Pulpit (Arisaema triphyllum) - 08) Notice how much darker the coloration of this jack-in-the-pulpit is than of the one in the previous photo. (Jack-in-the-Pulpit (Arisaema triphyllum) - 09) This is another close-up photo of the jack-in-the-pulpit flower. (Jack-in-the-Pulpit (Arisaema triphyllum) - 10) The flower of the jack-in-the-pulpit has faded away and exposed the berry cluster. 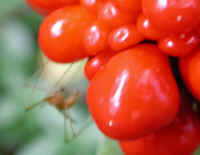 When ripe, the berries turn red. (Jack-in-the-Pulpit (Arisaema triphyllum) - 11) This is a closer look at the unripe jack-in-the-pulpit berry cluster. 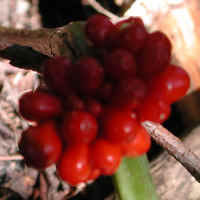 (Jack-in-the-Pulpit (Arisaema triphyllum) - 12) This is a close-up view of a jack-in-the-pulpit berry cluster. 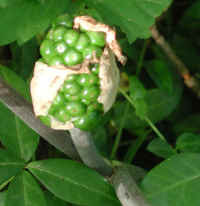 (Jack-in-the-Pulpit (Arisaema triphyllum) - 13) This is another nearly ripe jack-in-the-pulpit berry cluster. 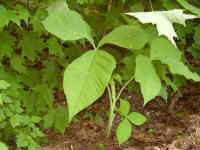 The leaves are from other plants. (Jack-in-the-Pulpit (Arisaema triphyllum) - 14) This jack-in-the-pulpit berry cluster is hiding in the shadows of the woods. 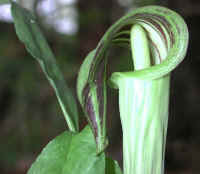 (Jack-in-the-Pulpit (Arisaema triphyllum) - 15) Margaret Ligas sent us this photo and comment, with our thanks: "Thought I'd send this picture of a Jack-in-the-Pulpit that I have growing in the garden at my cottage. This is only one of about 15 plants that appeared this year. For the past 20 years we only had 1 plant. Last year we had three and then this past summer we had an abundance. The original plant was about 24" this year, the tallest so far. - My son in England sent me the link to your site and I am really enjoying it. If I am lucky next summer and have another large patch of the flower I will send you more photos of the whole patch. (Jack-in-the-Pulpit (Arisaema triphyllum) - 16) This is another cluster of Jack in the pulpit berries. The leaves are from other plants. (Jack-in-the-Pulpit (Arisaema triphyllum) - 17) This is another look at the Jack in the pulpit berry cluster. (Jack-in-the-Pulpit (Arisaema triphyllum) - 18) We found this cluster of Jack in the pulpit berries to be very interesting, because of the different sized of mature berries. (Jack-in-the-Pulpit (Arisaema triphyllum) - 18a) When we took this photo, we did not realize that a female mosquito was on the Jack in the pulpit berry cluster, or we would have taken more photos of her. Even though she is partially out of focus, it looks like she is trying to insert her proboscis into a berry, which, if this is what she is really doing, is counter to all the things we have read about mosquito behavior and feeding. (Jack-in-the-Pulpit (Arisaema triphyllum) - 19) This is another photo of the Jack in the pulpit berry cluster with the visiting mosquito (still partially out of focus), but it does look like she's feeding on a berry. (Jack-in-the-Pulpit (Arisaema triphyllum) - 20) This is a newly opening Jack in the pulpit. At this stage of development, the leaves are not fully opened and the pulpit canopy has not yet curled forward. 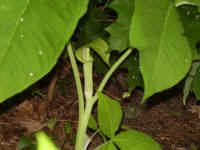 (Jack in the Pulpit (Arisaema triphyllum) - 21) This photo of the a Jack in the pulpit growing beside some young maple trees was sent to us by Julie E. Johnson with our thanks. 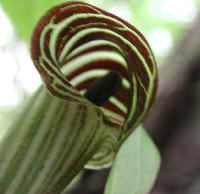 (Jack in the Pulpit (Arisaema triphyllum) - 22) This is another of Julie E. Johnson's photos of a jack in the pulpit. 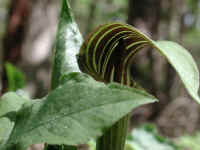 (Jack in the Pulpit (Arisaema triphyllum) - 23) This is another of Julie E. Johnson's photos of a jack in the pulpit. 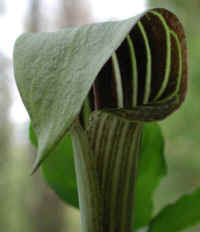 (Jack in the Pulpit (Arisaema triphyllum) - 24) This is another of Julie E. Johnson's photos of a jack in the pulpit. 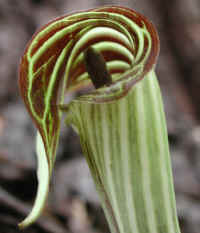 (Jack in the Pulpit (Arisaema triphyllum) - 25) This is another of Julie E. Johnson's photos of a jack in the pulpit.